As an update to this post, I'm making an executive decision. I can't stand it. I'm taking it away. Most of the time it won't even load properly for me (my connection is twitchy), and it slows everything else down. If you want to browse my blog, use the tags, or browse by month, or just search. I would use the feature if it weren't so sluggish, but it's driving me nuts so it's going away. Well, you gave it a try. I really like it for my blog, because it enables someone who's interested in a post on streetcars to see that there are other ones. It seems to take a day or two to catch up though, which is too bad.Sometimes, the fewer doo-dads you have, the better. Probably for the best - I did the same thing on Snail Mail Aficionado but almost immediately said "eww no" to it. Though I did keep it on my ephemera blog as it made much more sense there than it did on a letter writing blog. I rather like it myself Missive. 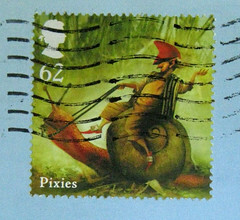 I'm using it on mailart365 after seeing it on here and, given the insistence on using labels it seems to work. Sometimes.